Classical philologist Przemysław Marciniak, who has received a Friedrich Wilhelm Bessel Research Award from the Alexander von Humboldt Foundation, will use it to carry out a collaborative project at the Chair of Byzantine Studies. Przemysław Marciniak, winner of the Humboldt Foundation’s Friedrich Wilhelm Bessel Research Award, will be hosted at LMU by Professor Albrecht Berger at the Chair of Byzantine Studies. Marciniak holds a Chair in Classical Philology at the Silesian University in Katowice. 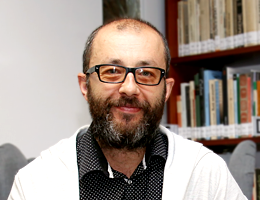 His research focuses on the history of Byzantine Literature, in particular satirical works and drama, and on the reception of Byzantine culture in the rest of Europe. He assembled an international research group devoted to this last topic in Katowice, which has meanwhile become the nucleus of the first Research Center for Byzantine Studies in Poland. The Center now serves as an institutional framework where Polish scholars work together with colleagues from abroad on projects of mutual interest. It also acts as the coordinating focus of the Byzantine Reception Network, which currently includes researchers from 11 countries who are studying topics relating to the reception of Byzantine culture. The Network’s most recent publication, The Reception of Byzantium in Europe since 1500, which appeared in 2015, was co-edited by Marciniak. During his stay at LMU, Przemysław Marciniak will study reactions to the fall of Constantinople recorded in European literature, and complete the commentary on his Polish edition of the Philopatris, a Byzantine satire written in the 11th century. The Institute of Byzantine Studies, History of Byzantine Art and Modern Greek Studies, where he will work in cooperation with Albrecht Berger, is ideal for Marciniak’s project, thanks to the wide range of bibliographical resources provided by the Library in LMU’s School of History. Last year LMU also welcomed two winners of the Bessel Research Award. The materials scientist Professor Omar Saleh from the University of California in Santa Barbara is the guest of physicist and DNA origami specialist Professor Tim Liedl, a member of LMU’s Soft Condensed Matter Group. And Professor Heiner Igel of the Department of Earth and Environmental Sciences is hosting geophysicist Professor Magali Billen from the University of California in Davis, who uses seismological data and numerical modelling to understand the dynamics of subduction zones, where parts of the Earth’s crust and upper mantle sink into the lower mantle. According to the Humboldt’s Foundation’s guidelines, internationally renowned scientists and scholars from abroad who completed their doctorates less than 18 years ago may be nominated for a Friedrich Wilhelm Bessel Research Award “on the basis of their outstanding research record”. They are invited to spend a period of up to one year cooperating on a long-term research project with specialist colleagues at a research institution in Germany. The awards are worth 45,000 euros, and are conferred on approximately 20 researchers each year.